She’s a wizard with food. That’s a fact. Her cookbooks are remarkably reliable. A year ago, when I interviewed Ina Garten on Boston’s Symphony Hall stage, I told the audience of 3,000 people that reaching for her books is like reaching for happiness. In her most recent cookbook, Make It Ahead, she shares a sensational recipe for sweet potatoes that are baked twice, the soft insides pulled out and folded back into the casings with Taleggio cheese, shallots, fresh thyme and butter. Absurdly good. Perfect for Thanksgiving. Preheat the oven to 400 degrees. Line a sheet pan with aluminum foil. Place potatoes on the pan and cut a few slits in each to allow steam to escape. Bake the potatoes for 50-60 minutes, until very tender when tested with a skewer. Set aside for 10 minutes, until cool enough to handle. Meanwhile, heat 1½ tablespoons of the butter in a small skillet over medium heat. Add the shallots and sauté 4 to 5 minutes, until tender. Add the thyme and cook for 1 minute. Set aside. Cut the potatoes in half lengthwise and with a teaspoon carefully scoop out some of the warm potato into a medium bowl, leaving a 1/2-inch-thick shell of sweet potato. The potatoes should look like little canoes. Sprinkle the potato shells generously with salt and pepper. Add the remaining 4 tablespoons of butter to the scooped-out potato flesh and mash it with a fork. Add the egg, shallots, Taleggio cheese, 3/4 teaspoon salt, and 1/4 teaspoon pepper and stir until combined. 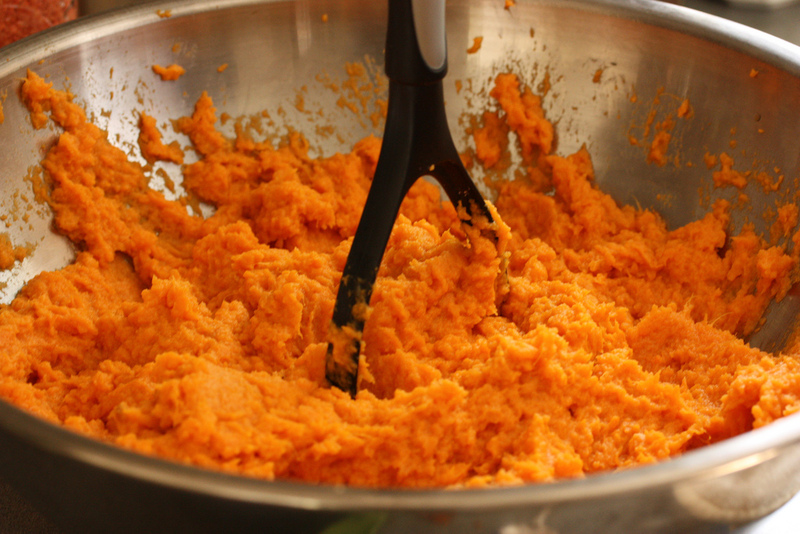 Spoon the mixture into the sweet potato shells and top each with a sprig of fresh thyme. Bake for 20 to 30 minutes, until puffed and lightly browned. Serve hot. I was so excited to make these because everything in Ina’s books are amazing. However, I was not prepared for the stink of the Taleggio cheese. I thought it would be mild but it took over my kitchen. 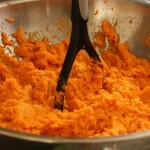 Although the sweet potatoes tasted great the smell was over powering and just a huge turn off. I would make again if there was another cheese to substitute! I made this twice-baked sweet potato recipe and used brie instead of taleggio. They were delicious and am planning to make them again for Thanksgiving. Joanne, that thrills me because, like our pal Jacques Pepin, I’m a believer in making a recipe your own after you’ve tried it once, or you know you don’t like a certain flavor. Good for you! I made these delicious potatoes and found no “stink” to my Taleggio cheese. I purchased it from The Pantry in Washington Depot, CT and found it to be a fresh, delicious, creamy cheese. I have purchased other “smelly” cheeses and found that the longer I’ve had them, the “smellier” they become. Perhaps that was the case with the cheese you purchased? Perhaps the vendor had had it a while? I think this recipe is worth trying again. I made these potatoes and served them with Ina’s Herbed Pork Tenderloin and Ina’s Apple Chutney – a fabulous meal. Note: When I look for something I’ve not used before, like Taleggio cheese, I always go to a respected cheese monger. I can rely on them for the best product. Taleggios made the traditional way with unpasteurized dairy have a very strong scent. Many modern Taleggios are pasteurized, greatly reducing the smell (but also reducing the flavor). Smell before you incorporate is the best practice. This sounds delicious. What do you do to make it ahead? Do you refill and bake again the next day? Or do you make completely and reheat the next day? I have to transport the whole Thanksgiving day meal to my elderly relatives. It’s a 35 minute drive. Any suggestions will be appreciated. They do have a regular 30″ gas stove/oven, but their kitchen is not easy to work in. I need to have most everything done at my house. Thanks for all your suggestions. I love the Food Schmooze! I couldn’t find Taleggio so I used Fontina instead which is similar and it was delicious! in fact, i am just going to use that instead all the time. hope that helps. i would steer clear of the mascarpone as it may be too creamy once it melts and can be too sweet with the already sweet potato. just my thoughts! Made this recipe using Manchego cheese and our family raved about them! Multiple requests for the recipe. Also had to make them the day before, including baking them. There was never any time on Thanksgiving when we could have used our oven. We microwaved them to re-heat before serving. Perhaps not ideal, but it worked for us and they were delicious. What would you think about freezing these? It could be one more thing I could do ahead? 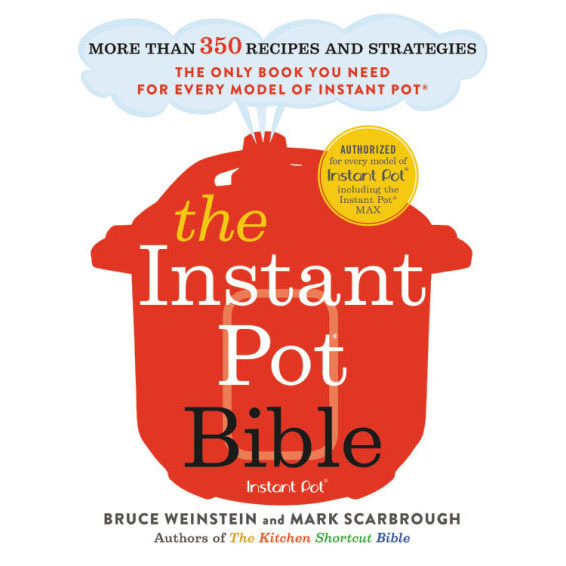 Ina Garten’s cookbook instructions are, “Assemble the sweet potatoes and refrigerate them for up to 24 hours. Bake before serving.” I’m quoting her here because she’s so thorough. Since her book was about making things ahead, I’m guessing she would have told us that we could freeze them, yet she didn’t. I wouldn’t. Question: when you bake ahead, at what temp do you bake them at for 20-30 minutes?…. Again, at 400?? I had the same question as Julie regarding baking temperature. I have them all stuffed and ready to go and 400 seems way too hot. I’m back again after a couple of days since my Passover dinner this past Monday. I went ahead and baked them at 400 and they were fine. I’m still going to give this 5 stars because I know the recipe would have been perfect had I been able to get Teleggio. My neighborhood gourmet market which normally has every cheese on the planet just happened to be out of Teleggio. I used a soft Fontina instead and it just didn’t melt the way it should have. Will definitely try again. Served them with the brisket and leek/onions recipe from her “Cooking for Jeffrey” book. That dish was truly amazing. So glad it was a hit. Happy Passover!